Yesterday, I went to the farmers market here in Downtown Sacramento. Although the farmers market in San Francisco is more fun to go to, Sacramento has the better produce. The coolest thing about this farmers market is that there are two that go on literally a block away from one another. The bigger, more commercial market, is the Certified Farmers Market and the other is the homegrown farmers market. The latter is amazing, you’ll find Asian produce such as bitter melon, extremely hot Thai chili’s and small eggs that were laid for the first time by young hens, at dirt cheap prices! 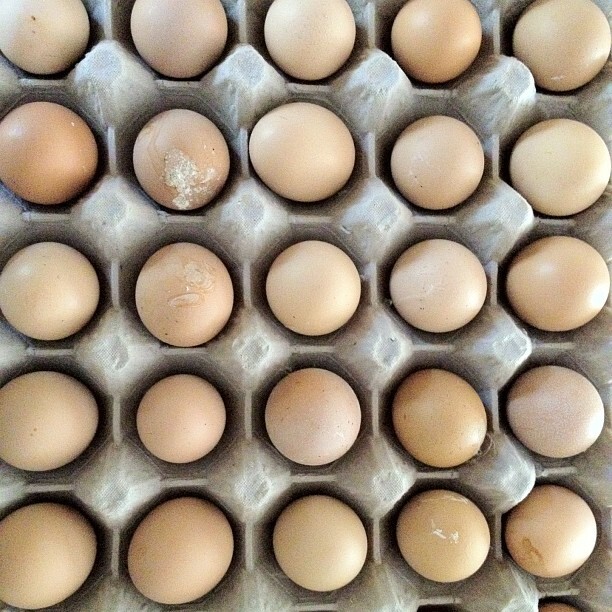 I happened to purchase the small eggs, a whole tray for $3. 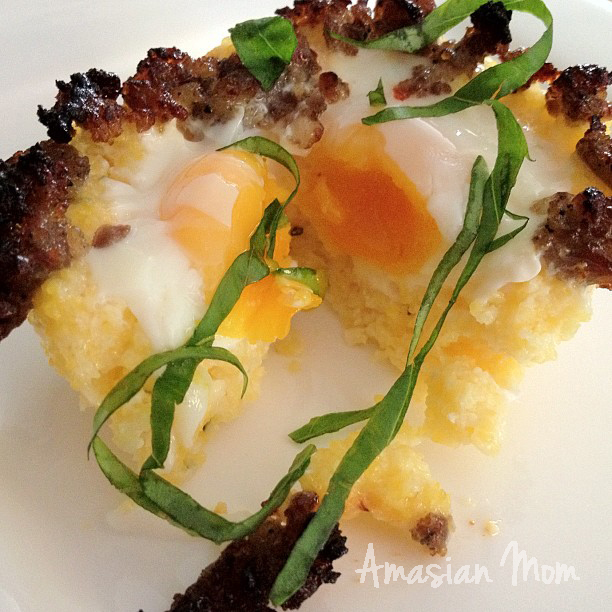 Since I came upon these delectable little eggs I thought I would make creamy polenta cups with hot Italian sausage. So delicious and fulfilling. I got the recipe from Muffin Tin Chef but changed it a bit to my liking. Hope you enjoy! Line the muffin tin with paper liners and preheat the oven to 400° F. Bring the milk and water to a simmer over medium heat. Add the polenta to the simmering pot and whisk for 3-4 minutes until it begins to resemble creamy oatmeal. Take it off the heat and stir in the rosemary, parmesan and salt. Set aside. Heat a little skillet with the grapeseed oil and cook the sausage until browned. Divide the polenta into the 6 cups and use your fingers to make a deep indentation. Crack one egg into each cup. Sprinkle the sausage over the cups. Put the muffin tin over a baking sheet to avoid leakage and put in the oven. Bake for about 15-20 minutes just until the yolks are slightly runny. Chiffonade the basil leaves, sprinkle over cups and serve! 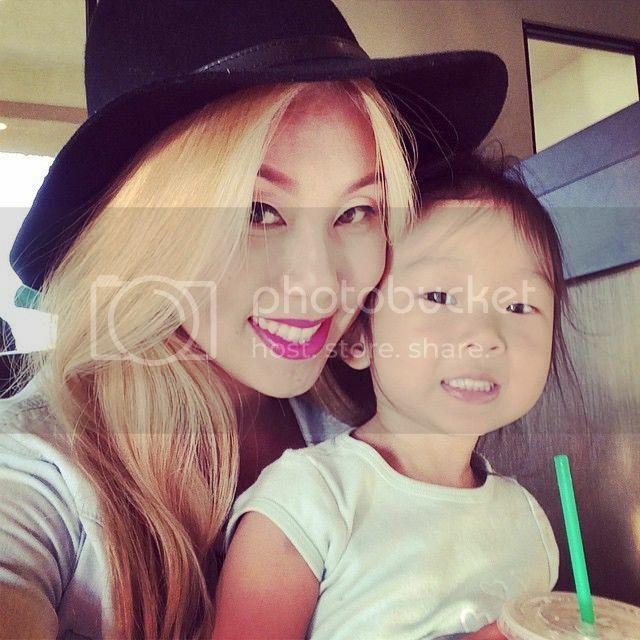 If you don’t know too much about the Vietnamese culture, let me tell you a little bit about us. Here in California, we’re everywhere! We dominate San Jose, Sacramento and Orange County. The men love smoking cigarettes and drinking strong iced coffee sweetened with condensed milk brought to them by Vietnamese girls in skimpy bikini’s and lingerie. The women love to wear premium denim, high heels and Louis Vuitton bags. But all of us VN people share one thing in common, PHO! It’s a dish that can be eaten for breakfast, lunch or dinner. 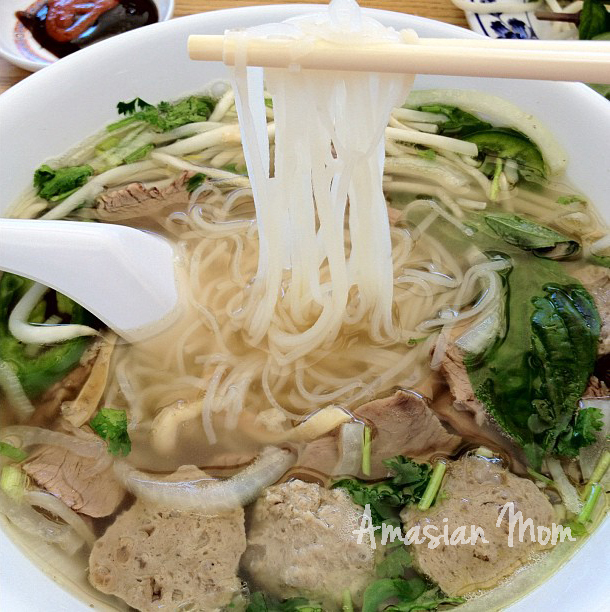 I’ve had pho in many different places all around Cali, but the one bowl of pho noodle soup that almost makes my heart skip a beat just thinking about it, is the bowl of noodles from Pho Anh Dao. I’ve been told from the owner that there is no MSG in their broth, it’s always fresh and piping hot. There are two different kinds of broth – chicken or beef. Pho Anh Dao is famous for their chicken pho but they sure know how to make the beef one too. In the photo above is my usual, beef pho with brisket and meatballs. I don’t care that it’s summer and 100 degrees outside, I can eat this anytime! If you ever have the chance to try this place, make sure you don’t get there too late… when they run out of their fresh ingredients, they close up for the day! 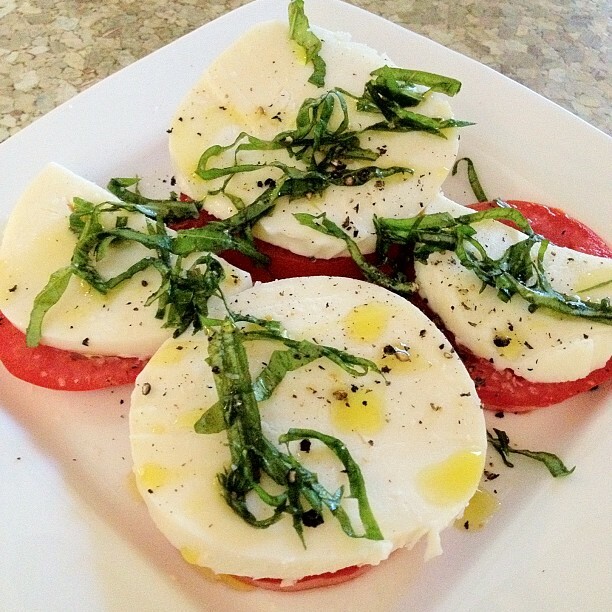 Wash the tomato and cut 1/4″ thick slices, cut the mozzarella into 1/4″ slices as well and lay on top of tomato slices, chiffonade the basil leaves (do this by stacking the leaves on top of each other, roll them up, lay it in front of you horizontally and slice thinly), drizzle the olive oil over the tomatoes and mozzarella, sprinkle with salt and pepper to taste, then garnish with chopped basil. That’s it, Enjoy! I am all about cooking delicious meals real fast. Khanh and I have been packing up the life we’ve built together in our San Francisco apartment because we’re moving back to our hometown Sacramento. I wanted to make one last special meal for him here that didn’t take up too much time and effort. 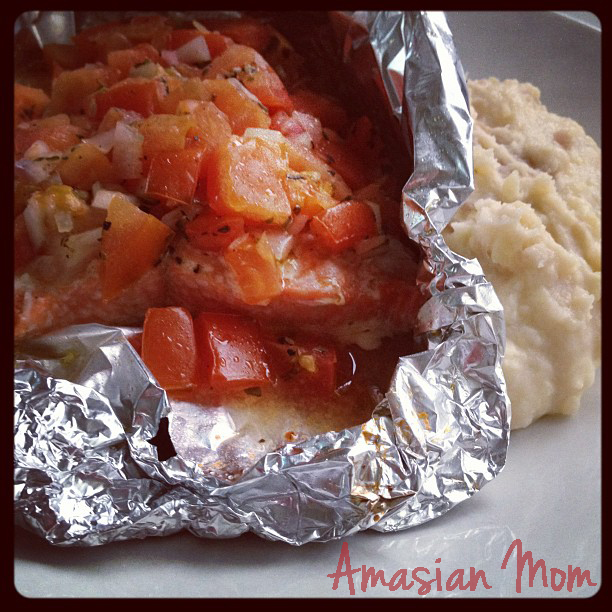 So I turned to this Giada De Laurentiis baked salmon recipe that I’ve used before and really loved. I also added a side of mash with fontina cheese. Our dinner was bittersweet… Delicious and sad that it’d be the last real meal here. For the mash, I boiled fingerling potatoes-skin on, drained the water, and put it back on low head, then added a bit of butter, milk, salt and freshly grated fontina cheese. Yesterday, my God Sister, Calix, came over to visit my little family before we move back to Sacramento, which will be on July 12th. I had baked white chocolate chip macadamia nut cookies and she baked peanut butter chocolate chip the night before so we exchanged goodies! Her cookies were very delicious, but although they were soft I wanted them to be a bit more chewy. Since I am moving, I want to try to use as much ingredients from the fridge as possible. I had a 1/2 cup of peanut butter left in a jar so I decided to make more peanut butter cookies. Here’s the link to the recipe my sister used. 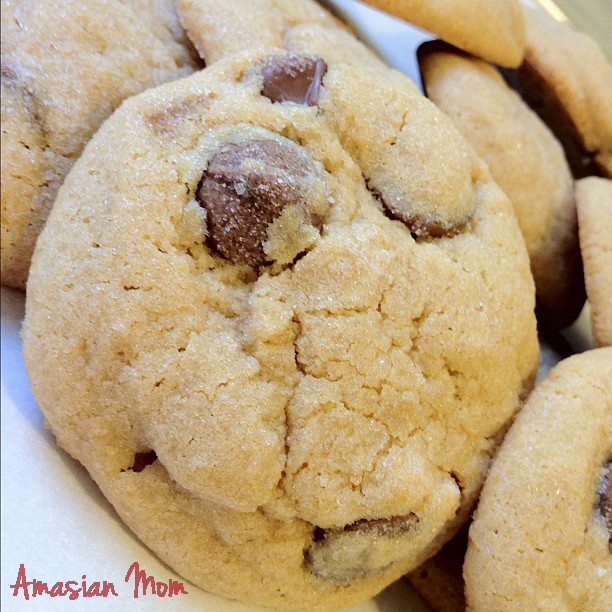 If you like soft cookies but don’t care for the chewiness this recipe is for you! However, if you like a chewy cookie try my recipe below. Beat together butter and peanut butter until well combined. Add sugars and beat until fluffy. Add egg, milk, and vanilla extract and mix until smooth. Add flour, baking powder, salt and mix just until blended. Roll balls of dough in white sugar before placing on an ungreased baking sheet. Bake at 350 degrees F for 12 to 14 minutes. Do not over bake, they shouldn’t get brown. They’ll look a little puffy and undercooked but they’re not! Let the cookies cool on baking sheet for at least 3 minutes before removing to wire racks to cool completely. Store in an airtight container at room temperature.